16.250 bags with documents torn to bits, from the Ministry of State Security — a gigantic puzzle that cannot be overcome by the hand of man. Scientists from the Fraunhofer-Institute for Production Systems and Design Technology (IPK) in Berlin automatically reconstruct parts of this heap of paper bits, in a pilot project. By means of a new scan technology from Janich & Klass, Arvato Services digitizes the bits in duplex mode, in high quality at high speed. 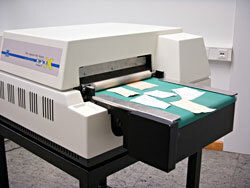 After the paper bits are scanned, they are virtually composed by the software that is developed by the Fraunhofer IPK. In order to keep the secrets of the regime, the former Ministry of State Security systematically pre-destroyed paper files in the period from autumn 1989 to January 1990. The amount of documents was so huge that the paper shredders broke. A big portion of files had to be torn to pieces manually. Estimations say that 40 million A4 pages were torn to 8 to 30 bits each. Until now, only a minor portion of these documents could be reconstructed because manual composition requires lots of time. If these approximately 600 million paper bits must be composed by hand, thirty persons would require about 600 to 800 years. At Arvato Services, the special scanner that is constructed by Janich & Klass processes small paper bits trouble free and fast. For the photo, the bits were placed side by side — usually they are scanned individually. Scientists of the Fraunhofer IPK actually develop a computer-supported process to manage the puzzle of bits faster and more efficiently, in future and will thus enable an early evaluation of these paper files. Using the automized way, the reconstruction would require about five to seven years. 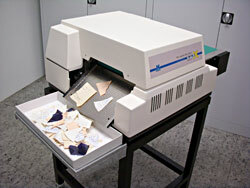 In order to allow reconstruction of the Stasi files in an automatized process, both sides of the puzzle bits must be digitized. This is done by scanners that were developed by Janich & Klass specially for this task. "The specific feature of the scanner named "Sisyphos 07" is that it can process even most tiny paper bits of 2 x 2 centimeters in high quality and also at high speed", says Dietmar Janich, Managing Director of the document processing specialists Janich & Klass. "Other high-end scanners can process only paper in standardized formats, starting from a certain size. Many bits of the Stasi files, however, are much smaller, they have no format and no contours" continues Janich. In particular: The paper bits are easily fed to the scanner, they are not laminated with foil, nor treated in any additional way. For digitizing, the bits are scanned from both sides. The digital images can be analyzed, they are sorted to categories, and stored in a database. "This virtual puzzling follows the logic of manual puzzling" explains Dr. Bertram Nickolay, Head of the department for Security Technology at the Fraunhofer IPK. For solving this test of patience, a human being utilizes a multitude of features to decide whether two bits match, or not — for example the form of the bits, their color, or the writing on the puzzle parts. This pre-selection eases searching and finding of matching puzzle parts. "Also the virtual puzzle process starts this way" says Nickolay. "The system calculates different describing features like form or texture in order to reduce the search area. With this smaller amount, the reconstruction process is run." The bits are compared and inspected along their contours for matching borders. When matching parts are found, they are composed to a larger document. Then, the process restarts from its beginning. Bit by bit, page by page the Stasi files are restored. The pilot project for automized reconstruction of the Stasi files runs for two years and comprises 400 bags. The sense of the pilot phase is mainly to gain knowledge about the method and technology of the reconstruction process. The customer is the Authorized Federal Representative for the Document Files of the Stasi / Secret Police of the former German Democratic Republic (BStU). The scanner has a resolution of 300 dpi, uncompressed, for duplex scanning with 24bit color depth. It processed paper bits sized from 0.5cm x 0.5cm up to 28cm x 50cm at a speed of 27cm per second. This meets an effective throughput of up to 500 m2 or 40MB per second. The rectilinear transport by belts is optimized for inhomogeneous originals. The transport system works without rollers or edges. Crumpled bits are lightened without shadows, starting from prototype 02. In order to avoid image interferences by dust or stains, the paper feed works without glass. Bits that lie next to each other are automatically separated.